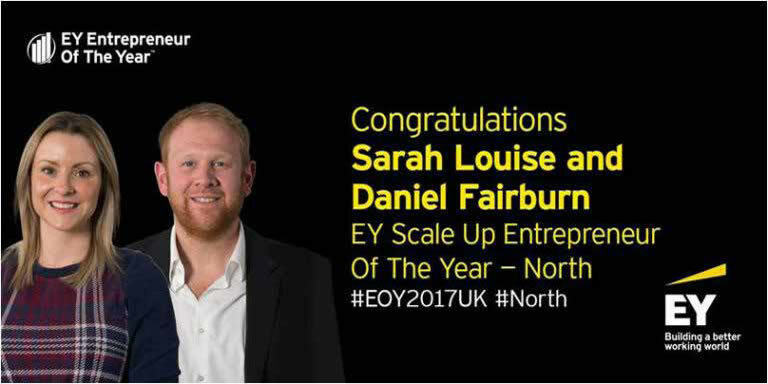 Fairburn’s innovation, integrity, vision, and solid future planning paved the way for Daniel and Sarah Louise Fairburn to claim the Ernst and Young Northern Entrepreneur of the Year Award for Scale-Up business in June 2017. Today Sarah Louise has been invited to join the EY Entrepreneur of the Year team as a judge. Now in its 32nd year globally and 20th year in the UK, Entrepreneur of The Year is more than a business award. It’s a global programme that helps and supports entrepreneurs build successful and sustainable businesses in more than 150 cities in over 60 countries. In the UK, the awards operate across four regions – London & South, Midlands, North and Scotland – culminating in a national award event in October to announce the UK Entrepreneur of The Year winner. The winner will then go on to compete for the prestigious title of World Entrepreneur of The Year in 2019! Energetic and ambitious, Sarah Louise Fairburn’s no stranger to the challenges in business! Her tenacious nature helped lead the way when L J Fairburn & Son Limited was faced with a ‘sink or swim’ scenario. A new strong and versatile business model, ensuring sustainability, was developed by Sarah Louise, husband Daniel Fairburn and sisters Caroline and Sarah, allowing generations of the Fairburn family to carry on in farming, as the egg production business now continues to flourish.